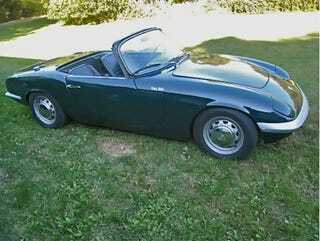 It's a rare occurrence when a 1964 Lotus Elan shows up on eBay. Rarer still is when it's in Stoughton, Wisconsin. More rare? When the eBay listing's phone number is for the wife of Road & Track's Peter Egan. Why is Peter Egan, one of our favorite automotive scribes, selling his '64 Elan? More to the point, why isn't Egan noting that the car is his in the eBay listing? Wouldn't you think that would boost the price it could be sold at — especially considering the very same Elan's been featured in countless issues of Road & Track? Maybe not. Last month Egan mentioned the numerous problems he's been having with his lean, mean and green Lotus calling his "beautiful car" a "pain in the...rib cage" (he broke three ribs and his left foot crashing a motorcycle in Wyoming), hinting he might be ready for something new. It looks as though Egan may have finally succumbed to the shockingly painful electric feel his Lotus has continually provided for him. So what's next for Egan? Sounds like, based on last month's "Side Glances," he's looking for some 'merican muscle. Let's help him out in the comments below by finding him something new to play with. Maybe even give him a link to where he can find it on Craigslist, Hemmings or eBay.